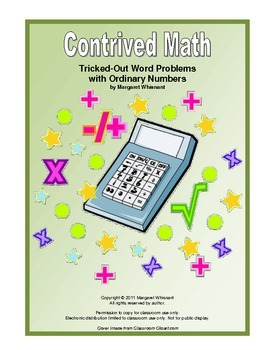 This download is for those students and their teachers who enjoy solving somewhat twisted, definitely unusual (aka "tricked out") word math problems. An equal combination of language arts and basic math skills, Contrived Math challenges participants to collect common data, such as the number of days in a year, shuffle it around according to instructions, and come up with a targeted answer. The activity is divided into two parts of twenty problems each. Full answer keys are included. Eight total pages counting the cover page. No charge! Download and enjoy!